A recent survey by the Livestock Auctioneers Association (LAA) revealed that 94% of auction marts provide training for their employees – investing in the future of their workforce and the welfare of the animals in their care. Of these, around two fifths have enrolled staff on the Livestock Market Operations and Management course at Harper Adams University. James Morrish, who was brought up on a tenanted sheep farm near Torrington in North Devon, is among the newly graduated students. At the age of 41 he readily admits that he had his doubts about returning to education. But a little gentle persuasion from his employers at West Country auctioneers’ Kivells changed his mind. “I was 37 at the start of the course and I wasn’t sure if I wanted to be there with people a lot younger, just starting out in their careers,” he said. “But the partners at Kivells persuaded me otherwise and I’m glad they did. James is no stranger to an auction mart – he started trading his father’s sheep after leaving school at the age of 16. He joined Kivells in 2005 to help with their PR and marketing after seven years as South West officer for the Rural Stress Information Network. It wasn’t long until he caught the auctioneering bug however, conducting his first sale at a farm near Lapford in North Devon in 2006. Following four years of study he has now graduated from the Harper Adams course, which is supported by the LAA. 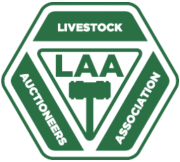 Students must be employed by an LAA member auction mart to be considered for enrolment and James said the topics covered have proved invaluable. It was an area that he was soon to experience first-hand. “A week after being taught all about it I was at market when a vendor brought in four sheep. “Trading standards suggested one of them was lame – but I didn’t think so. Fortunately, what I had learnt on the course put me in good stead, I was much better prepared and knew exactly what to do. James, who lives on a 70 acre farm next to where he grew up, continues to combine auctioneering with his role in PR and marketing for Kivells, while also being deputy leader of Torridge District Council. “I love everything about it,” he said. “It’s great fun and the buzz you get from a successful sale is second to none. “I firmly believe that as auctioneers we’re there to help both the buyers and the sellers. There’s an awful lot of trust. People need to have confidence that you’ll always try your hardest to achieve the best price, without taking advantage. In 2014/15 there were 34 students on the Harper Adams course – with 12 graduating this year. Topics covered include animal health and welfare, food supply chain management, agricultural marketing, financial analysis, HR and law, tax and evaluation. Students only have to attend university for two weeks a year - once in January and another in July, the rest is done through distance learning coursework to fit in with their busy working life. Mark Simcock, Principal Lecturer for the course, said: "The course continues to be strong and popular, showing that the industry is in fine fettle. “Its success and popularity clearly illustrate people are prepared to recruit and retain good people. We're talking about a serious financial commitment by the auction marts to invest in the next generation of professional auctioneers and market managers. It's good to see. "But it’s more than a training programme, this is an academic qualification. Many of the younger students left school at 16 with few qualifications. The Harper course enables them to get one. And for those who’ve been to college already or have other qualifications, it's an opportunity to further their education in an important area."